Novice swimming at De Anza College, KNES1A (formerly P.E. 26A), has many different kinds of swim students. Some are new to swimming, including some who have never been in a pool. Some students in this class will be over their fear and able to swim some, but not quite ready for a beginning swim class in water deeper than they are tall. Others are self taught, or have not swum for quite awhile and want to relearn from scratch. Others know breaststroke, but not freestyle. When I do surveys of students I find many who had some kind of swim class previously, but who just didn’t learn to swim. Others are in a pool or swim class for the first time. I teach from the very beginning. I don’t assume anyone knows how to float, or even how to get into a pool. I do assume many students will be uncomfortable at first. The teaching assistants and I teach from in the pool, not up on the deck. This class is not just for students in their late teens or early twenties. It includes people who come to De Anza College just to learn to swim, who are in their late twenties through thirties or forties and occasionally much older students. ” Swimming continues to be the second leading recreational pastime (behind walking) in all national surveys. 39% of adults in the U.S. said they are afraid to put their heads under the water. 62% said they fear deep, open water (which does not have to be the ocean, a big swimming pool can seem to be deep, open water). Believe it or not, most of my class will be (optional) jumping into the deep pool and (optional) most will jump feet first off the diving board at the end of the class. Fall quarter I usually teach one novice class Saturday, 10 a.m. to 11:50 a.m.
– – – and noon to 1:50 Saturday. 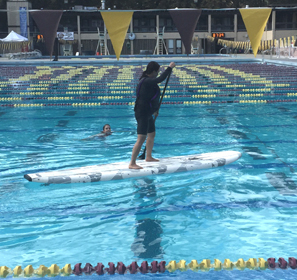 Summer quarter is usually one Saturday swim class class for only five weeks, 10 a.m. to 2:30. If you read about it too late to add, please at least be enrolled at De Anza before the first class. We will be in the water the first day of class, so bring your swimsuit, towel, swim cap etc. Yes, it is warm enough to take a fall swim class. We have mostly sunny days and you can wear a swim cap on days you are not quite warm enough, just like triathlete swimmers do. Novice swim is not offered winter quarter (January – March). Click on this link Novice Swim FAQs for more info including class cost and a link to De Anza admissions, enrollment and registration, which you can do online. There are details about how to register for KNES 001A.